Now that the results are officially known I can at least share the pictures here. I'll start with the entry that took the most time to prepare. 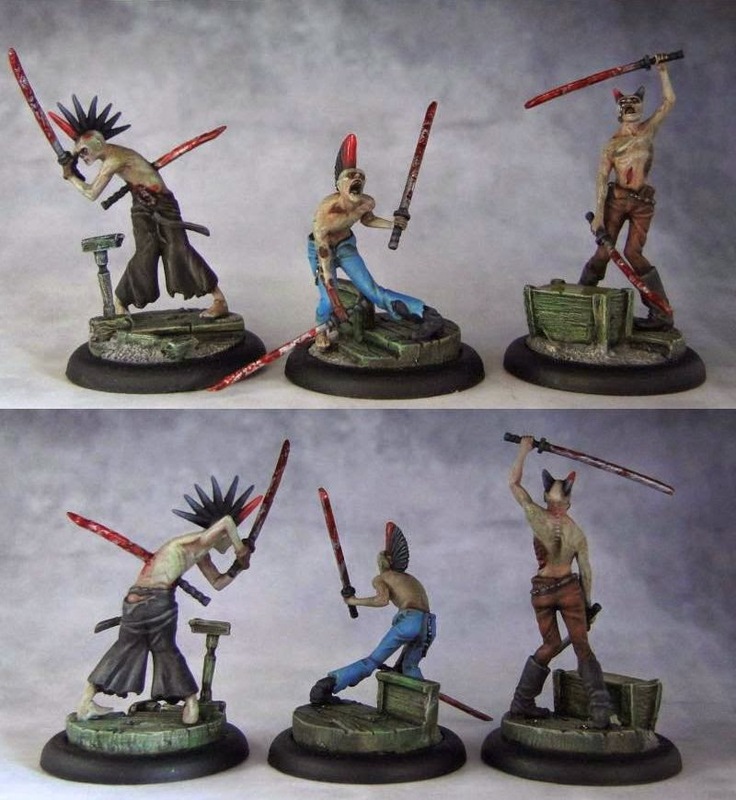 Nicodem and his undead minions was a natural choice for me in the crew category. I thought that these would benefit most from my gritty style and use of dark colors. I also like painting undead skin and have achieved some skill in getting it to look properly undead. However, I didn't expect to have so much work putting them together. The Punk Zombies minis are so flimsy! They're very thin, especially their limbs. Pinning them to the bases (metal base inserts) wasn't easy. 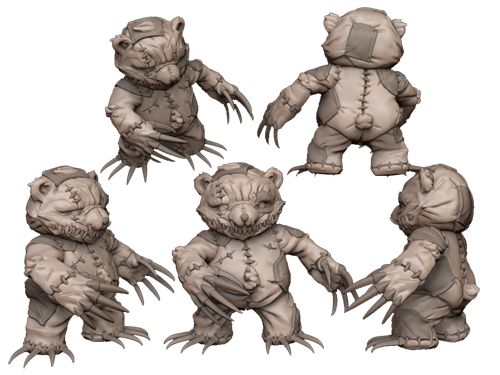 Mortimer was a fun piece to work with. He is an undertaker, so naturally his clothes are very dark. I had to use various shades of dark brown and carefully work my way up with highlights on black. His backpack with various unhealthy contents proved a much needed element of contrast and I could throw in a touch of lighter shades there. I used Ghost Town base inserts throughout the whole crew. 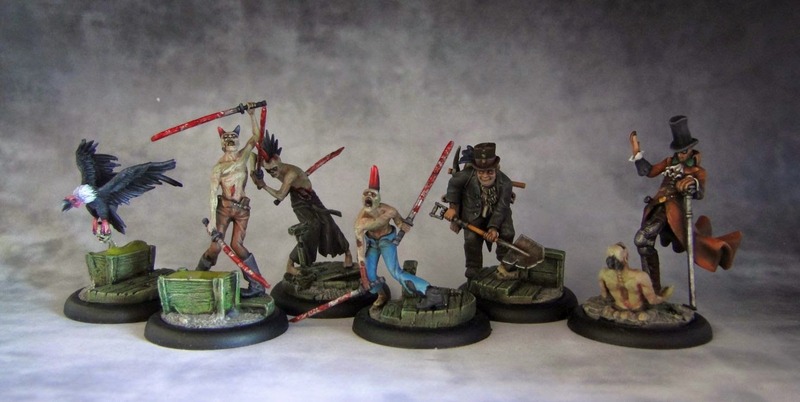 I think Nicodem is one of the epitomes of Malifaux. A true combination of various, often extremely different elements. 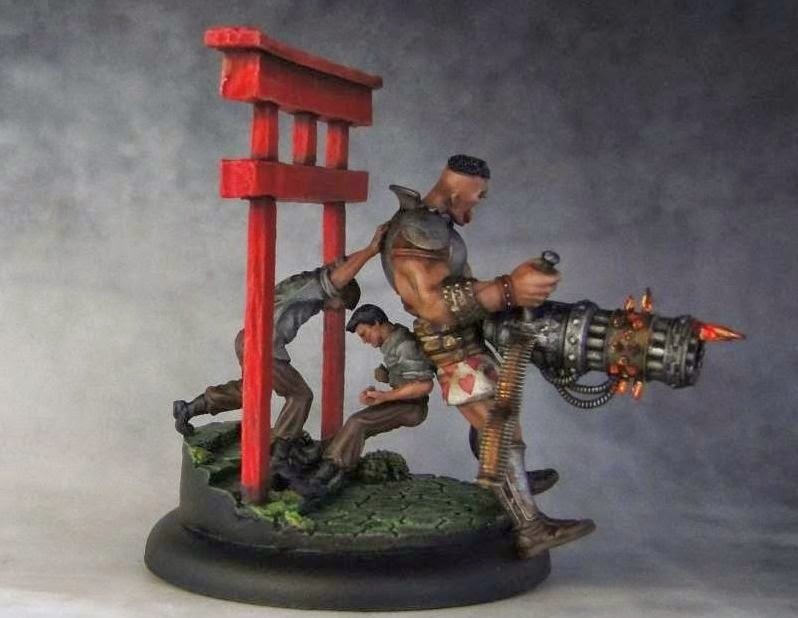 There's a necromancer, some steampunk elements, zombies that sport mohawks and Katanas. It only seemed right to add a wild west theme to that mix. Killjoy is a true beast. 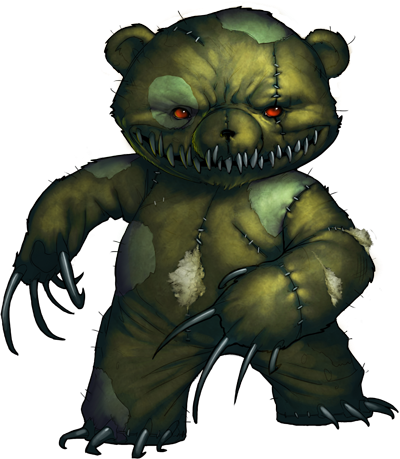 In game you don't ever want to face him. He easily unleashes powerful attacks, heals himself and what's more, he can even begin the game buried, popping up in the most inconvenient place for the opponent. 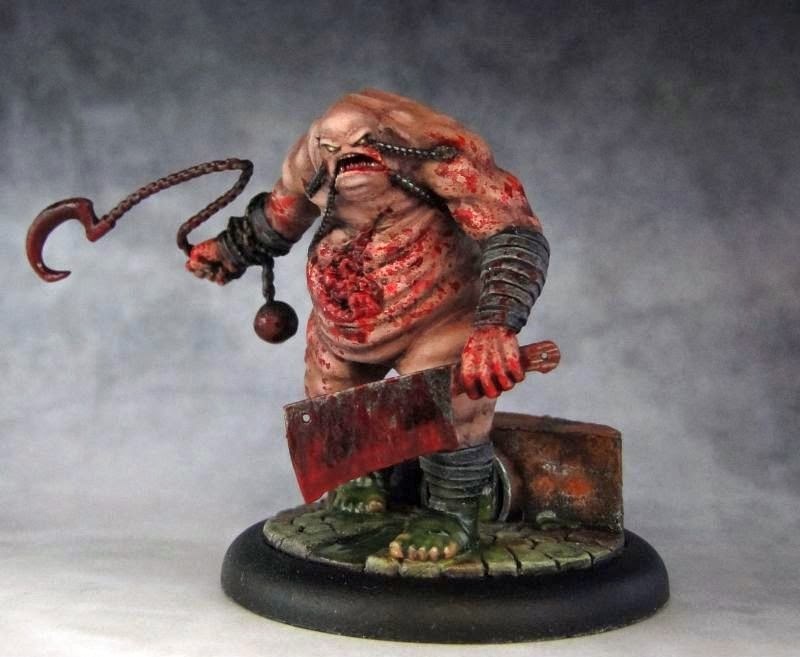 He spends most of the time in Malifaux sewers (hence the base with slime coming from the gutter and on his feet). The miniature reflects much of it and goes well with his fluff. 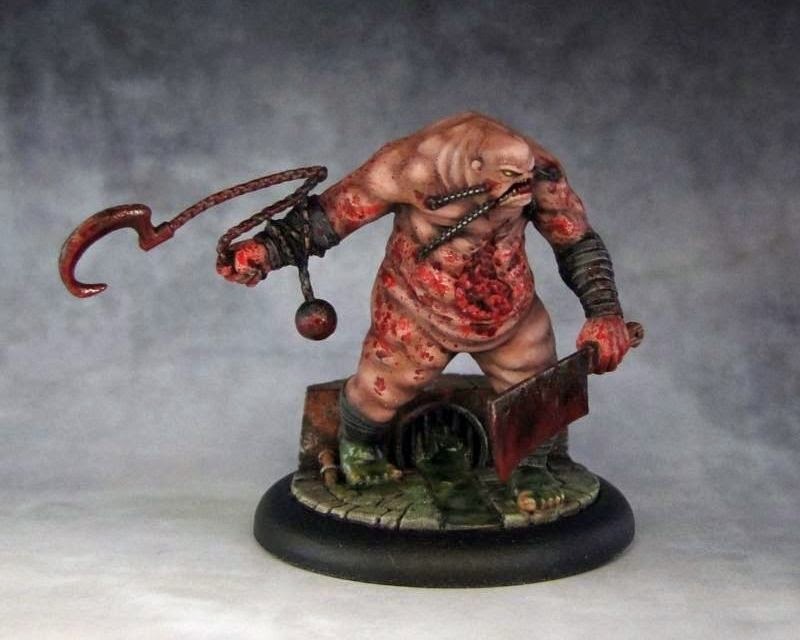 He's quite disgusting, the flabby stomach with intestines protruding from the middle is certainly a nasty sight. His ugly, inhuman face doesn't help either. Working on large skin areas wasn't easy as it required numerous layers of thinned down paint to get the highlights right. 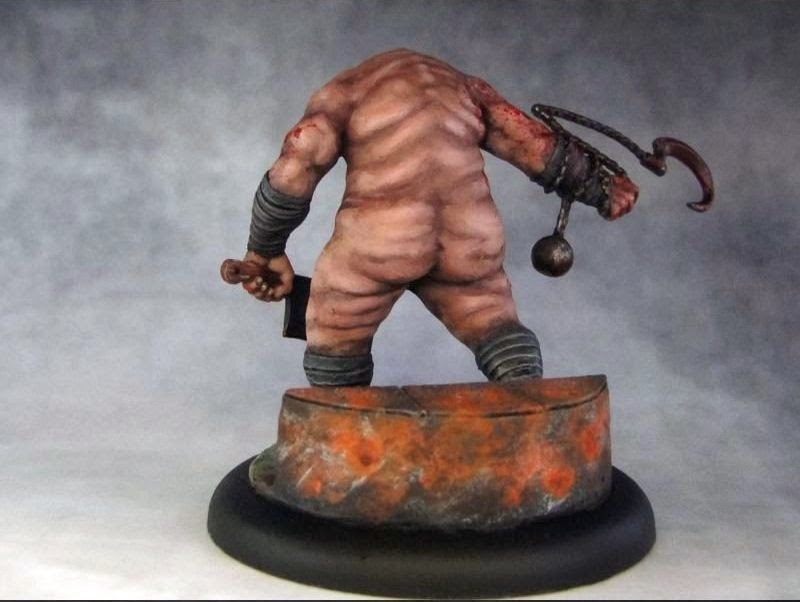 I also added some gore effects to the front of the model, focusing on the wounded stomach and weapons. Once again, I used Blood for the Blood God with some addition of Brown and Red P3 inks to keep the color richer and more saturated. And last but not least - a Ten Thunders Warlord. 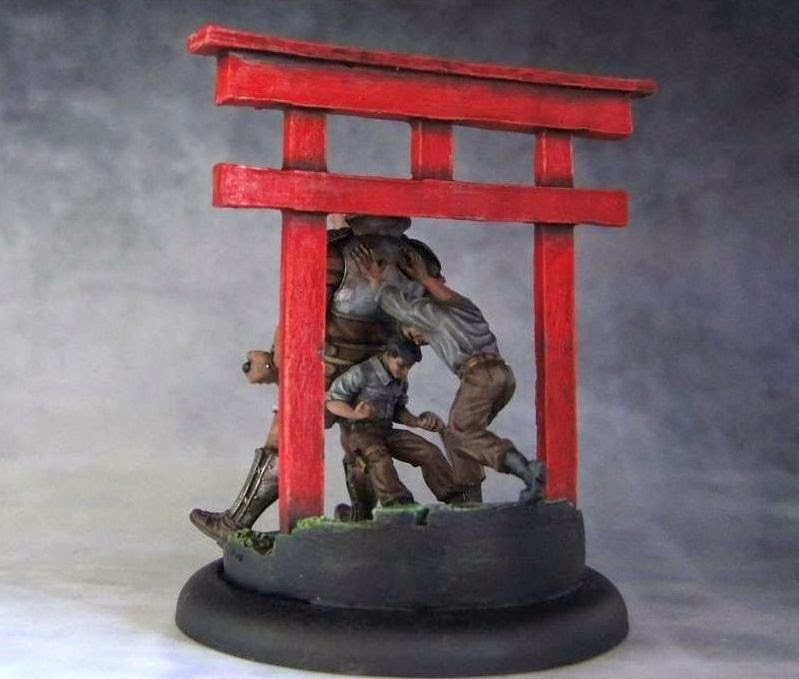 I had originally intended to enter him in the competition in the diorama category (the piece needed to have at least two models) but the admins suggested moving it to single category. And since Killjoy had already been there, this one has to stay put. Fuhatsu used to be a respected warrior before he had an accident. As a result, he must be at all times followed by his loyal servants whose job is to make sure he is properly armed for battle. And properly dressed for battle, which is not always a success. With armor +2 and a powerful minigun that can hand out damage in blasts he can be a game changer. The model is... well, it's way over the top to say it's not ridiculous. But it makes him even better. A mad giant with an enormous weapon pushed into battle by two scrawny peons. 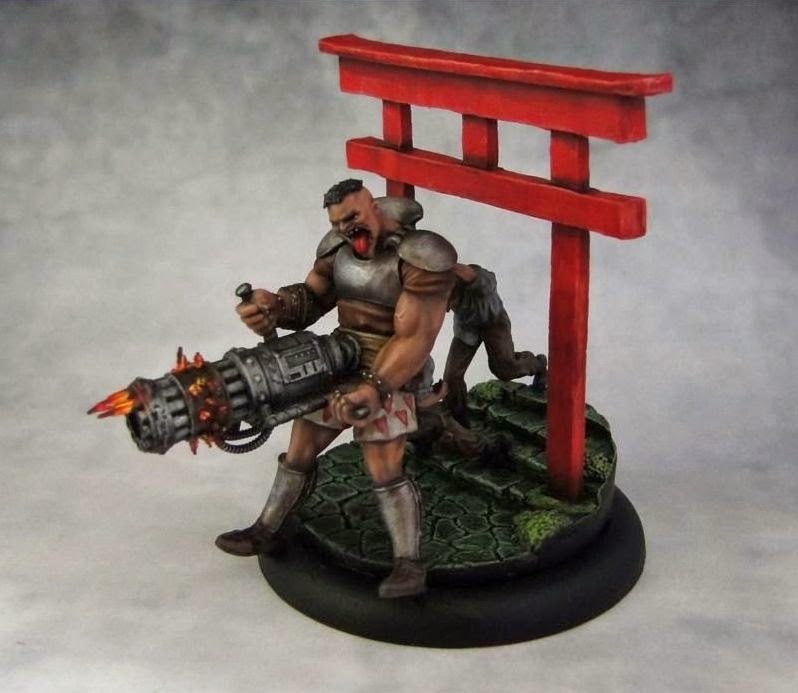 I used a Zen-themed base insert with stairs as I thought it would add even more dynamism to the miniature. 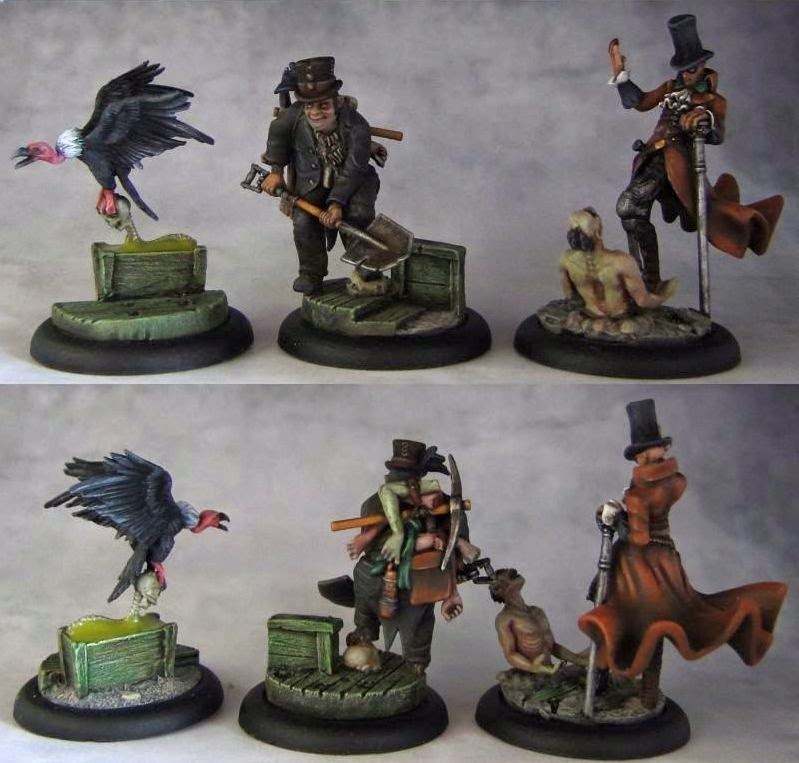 Also, the red added a bit more warmth as the servants' clothes are painted using colder shades. 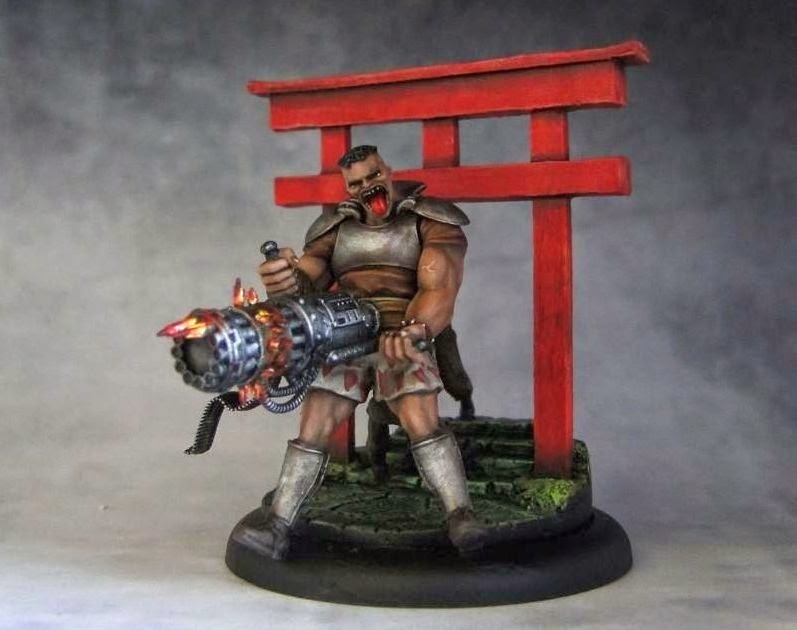 I'm going to paint a few more minis from Ten Thunders. I am currently enjoying plenty of free time so some updates on my current TT project should appear here later this week. 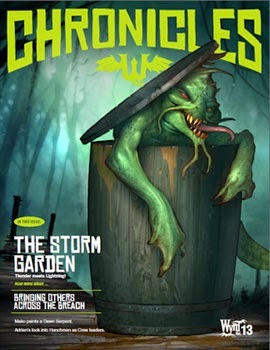 And one more thing - new issue of Wyrd Chronicles was released yesterday. As always, lots of cool stuff inside. New Fate Deck (in light and dark versions), a battle report, some stories, painting article and Gencon previews. I think I will be getting Dreamer and Lucious. And maybe a few more things is more stuff is released. You're right. Judges in online contests only have so much time to judge everything. This puts emphasis on giving your work a memorable first impression. Either way, these things still look great, and it's quite sad that they didn't pick your works. Anyway, perhaps on the next one you'll win, since you already know what to do. Good luck!